‘India must be free, India must be a republic, India must be united’ This famous quote of Madam Bhikaiji Cama summed up her ideal for independent India. Her contribution in Indian freedom struggle is invaluable. Since an early age, she took a keen interest in social and political work. Coming from a good background gave her exposure too many opportunities that she could work on. She married to Shri K.R. Cama. In 1902 due to declining health, she shifted to Europe, spending a year each in Germany, Scotland and France before settling down in London. It was in this period that she came in contact with many revolutionaries. She imbibed the notion of ‘Swadeshi’ from Shri Dadabhoy Naoraji. Madam Cama’s revolutionary and inspiring speech brought the wrath of authorities on her. She is also credited with the publishing of a new paper called the Bande Mataram. In the international Socialist Congress at Stuttgart, Germany she unfurled a tri-colour in green, yellow and red with the world “Bande Mataram” on it. 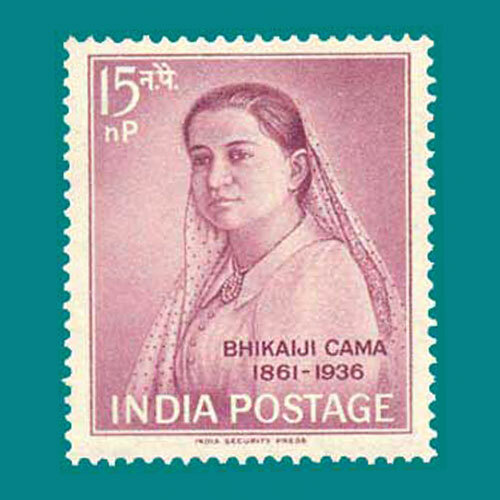 Bhikaji Cama gave many speeches and helped Indian freedom struggle gain world attention. On 13th August in 1936, this Bhikaiji Cama took her last breath in Bombay. To honour on her birth centenary, India Post issued a stamp in 1962.